Journal of Proteomics is aimed at protein scientists and analytical chemists in the field of proteomics, biomarker discovery, protein analytics, plant proteomics, microbial and animal proteomics, human studies, tissue imaging by mass spectrometry, non-conventional and non-model organism proteomics, and protein bioinformatics. The journal welcomes papers in new and upcoming areas such as metabolomics, genomics, systems biology, toxicogenomics, pharmacoproteomics. Journal of Proteomics unifies both fundamental scientists and clinicians, and includes translational research. Suggestions for reviews, webinars and thematic issues are welcome. All manuscripts are strictly peer reviewed and conform the highest ethical standards. 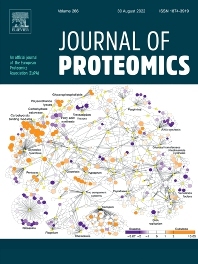 Journal of Proteomics is an official journal of the European Proteomics Association (EuPA) and also publishes official EuPA reports and participates in the International Proteomics Tutorial Programme with HUPO and other partners. Should you have an idea for a thematic issue, please complete the thematic issue proposal form and send it to the Editorial Office (Ms. Carly Middendorp, c.middendorp@elsevier.com). The guidelines to prepare a proposal for the journal can be found here.